The economic and political rise of the BRICS (Brazil, Russia, India, China, and South Africa) and Middle-Income Countries (MICs) have important implications for global agrarian transformation.These emerging economies are undergoing profound changes as key sites of the production, circulation, and consumption of agricultural commodities; hosts to abundant cheap labour and natural resources; and home to growing numbers of both poor but also, increasingly, affluent consumers. Separately and together these countries are shaping international development agendas both as partners in and potential alternatives to the development paradigms promoted by the established hubs of global capital in the North Atlantic and by dominant international financial institutions. Collectively, the chapters in this book show the significance of BRICS countries in reshaping agro-food systems at the national and regional level as well as their global significance. As they export their own farming and production systems across different contexts, though, the outcomes are contingent and success is not assured. At the same time, BRICS may represent a continuation rather than an alternative to the development paradigms of the Global North. The chapters were originally published in a special issue of Third World Thematics: A TWQ Journal. 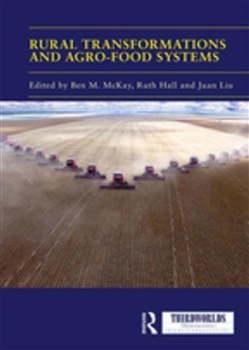 Acquista Rural Transformations and Agro-Food Systems in Epub: dopo aver letto l’ebook Rural Transformations and Agro-Food Systems di ti invitiamo a lasciarci una Recensione qui sotto: sarà utile agli utenti che non abbiano ancora letto questo libro e che vogliano avere delle opinioni altrui. L’opinione su di un libro è molto soggettiva e per questo leggere eventuali recensioni negative non ci dovrà frenare dall’acquisto, anzi dovrà spingerci ad acquistare il libro in fretta per poter dire la nostra ed eventualmente smentire quanto commentato da altri, contribuendo ad arricchire più possibile i commenti e dare sempre più spunti di confronto al pubblico online.